As a home cook that loves variety and flavor, I dream of the day when I can have a little garden of herbs right outside my kitchen. Even a window box would do, if I could only have the basil, rosemary and sage all within in reach. Alas, I should also mention that I have zero green thumbs. My lucky Bamboo is exactly that, that I have managed to keep it alive for almost four years without too much issue (I am sorry, Bamboo, for letting you sit dry for weeks at a time. My bad. Those yellowed leaves mostly perked back up, though, right?) That plus the overly-strong light on the patio in the afternoons makes for a virtual plant wasteland right now in the condo. And as for the future, maybe I can enlist someone else to help me remember to water the garden? In the meantime, I am relegated to buying herbs in the packets at the grocery store. As you all can probably relate, what ends up happening is that the one packet of basil is used partially for the one meal, then lays unused in the fridge until it wilts into nothingness. I HATE this. That was $3-4 dollars, just gone. Last year, fed up with this wastefulness, I started washing, drying, chopping and freezing the herbs individually. And now, voila, if I am making roasted potatoes, I can just pull out my little container of rosemary, sprinkle some on straight from the freezer, and put the rest back in place. Fresh flavor, frozen in time with no budget lost. It's magical. Over the weekend, I did the wash and prep routine with two more baggies, one of sage and one of basil. While I prefer fresh basil when it is a standout ingredient, things like pesto or sauces don't need "pretty basil" -- they just need the flavor. Hardier herbs like rosemary and thyme really stand up to the freezing, though, and you can pull those right out with no issues. In my freezer right now: rosemary, sage, thyme, parsley, basil and dill. I also keep a full chunk of ginger in there, and grate off what I need when a recipe calls for it. Do you freeze herbs? What are your favorites to keep around? I had never thought or heard of this! But it's a great idea! I have some fresh cilantro right now that I am going to try this with! Do you just wash, dry, chop and freeze??? Hey gal - yea! Dry them off really well to prevent freezer burn, and then I just store them in baggies. Some aren't as potent as fresh herbs, but the hardy ones are just like new. Chopped rosemary is my fav! I didn't chop the basil because I know it gets all black and wilty looking when you do that, so I left those whole. That's an experimental one for me, first time freezing that type of herb. Good luck! You can also chop the herbs, put a little in each compartment of an ice tray and freeze in little cubes. They are great to throw in soup or sauce at the last minute to get a blast of herbs! 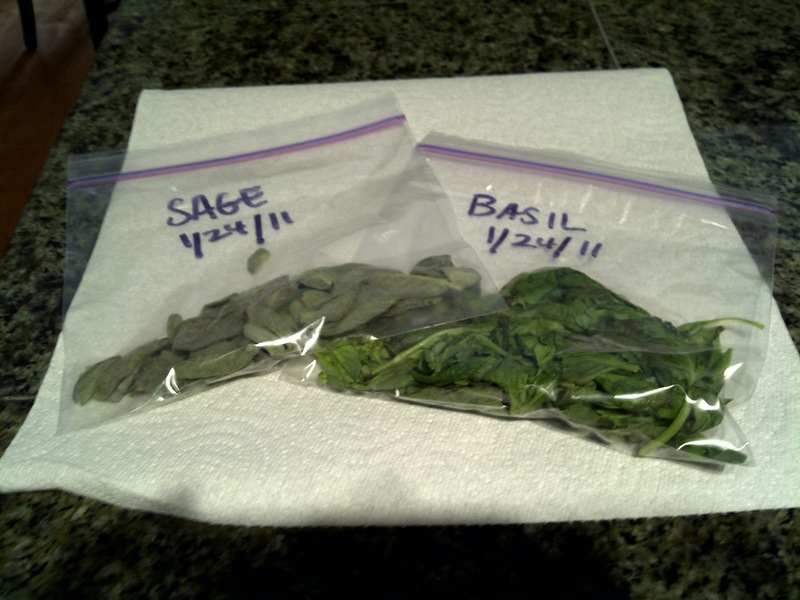 If you freeze basil with kosher salt, it helps prevent it from wilting the moment you take it out of the freezer. Also, I prefer to buy herbs at the farmers market. It's WAY cheaper. I get a huge bunch of basil for $0.99 there. Hooray! Great tips Bela, thank you! !